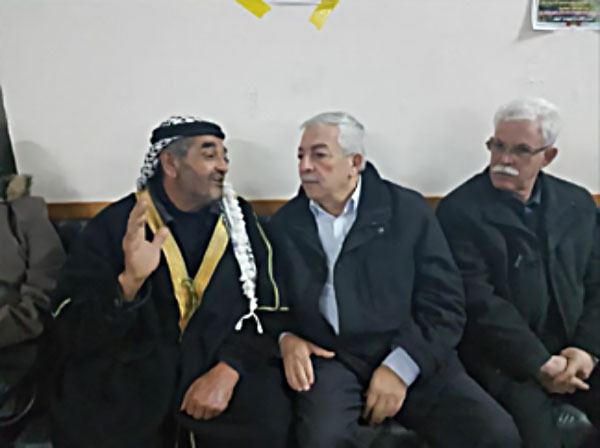 Senior Fatah figures Mahmoud al-'Alul and Jamal Muheisen and Dalal Salameh in the mourning tent in Jenin (Facebook page of Mahmoud al-'Alul, January 22, 2018). Picture of the visit posted to the official Facebook page (January 24, 2018). 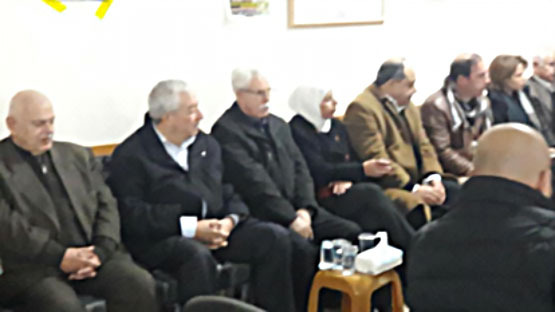 Governor of the Jenin district pays a condolence call at the Jarar family house (Facebook page of Jenin al-Hadath, January 20, 2018). On January 22, 2018, three senior Fatah figures paid a condolence call at the mourning tent erected by the family of Ahmed Isma’il Muhammad Jarar (one of the terrorists who carry out the shooting attack near Havat Gilad in Samaria that killed Rabbi Raziel Shevah). They were Mahmoud al-‘Alul, a member of Fatah’s Central Committee and deputy Fatah chairman; Jamal Muheisen, a member of Fatah’s Central Committee and in charge of the bureau of mobilization and organization; and Dalal Salameh, a member of Fatah’s Central Committee (Facebook page of Mahmoud al-‘Alul, January 22, 2018). A picture on documenting the visit was posted to the official Fatah movement Facebook page on January 24, 2018. Before the visit of the senior Fatah figures, Ibrahim Ramadan, the governor of the Jenin district, came to offer his condolences. He was accompanied by several commanders of the PA security forces. He also gave the family the condolences of Mahmoud Abbas. The governor denounced the “terrorism” of the IDF in Jenin on the night Jarar was killed, and said it would not prevent them from continuing the struggle for the establishment of the state of Palestine with east Jerusalem as its capital (Wafa, January 20, 2018). The governor also declared the establishment of a “popular committee” that would rebuild the houses of the clan that had been destroyed (Wafa, January 21, 2018). 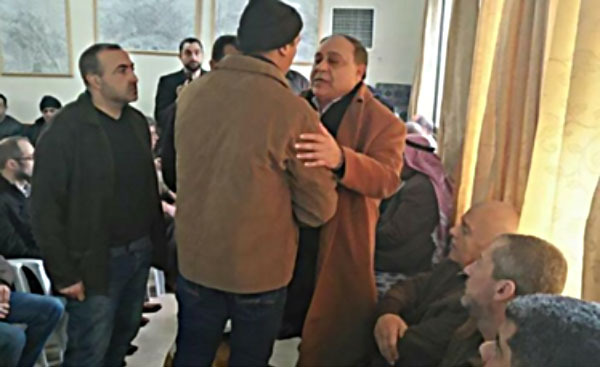 The moral support the Hamas-affiliated Jarar family received from the PA expressed the backing of the PA and Fatah for Palestinians who carry out popular terrorism (“popular resistance”) attacks. The support is also given when Israeli civilians are killed and even when the family and/or the terrorist may be affiliated with Hamas. The support of Fatah and the PA takes different forms, such as condolence calls to the families of terrorists who were killed; the publication of official Fatah death notices; PA military-stye funerals; financial aid given by the PA to the families of shaheeds, prisoners and the wounded; and glorifying the shaheeds in various ways. 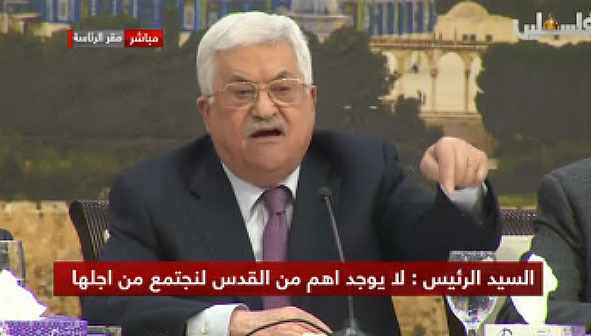 They all send the unequivocal message to the Palestinian public that popular terrorism attacks are supported by the PA and Fatah, and they encourage the Palestinians to continue the “popular resistance” (i.e., popular terrorism). Ahmed Isma’il Muhammad Jarar was one of the operatives in the terrorist squad that carried out a shooting attack at Havat Gilad (January 9, 2018). He was killed on the night of January 17, 2018, during an exchange of fire between Israeli security forces and the terrorist operatives hiding in a building in the Wadi Burqin neighborhood of Jenin (where the squad that carried out the fled). In addition, Ahmed Nasr Jarar, who was apparently the leader of the terrorist squad, escaped. During the activity the Israeli security forces destroyed three buildings of the Jarar clan. When the rubble had been cleared no bodies were found (Palinfo, January 19, 2018). The Jarar clan are known as Hamas supporters. Ahmed Isma’il Muhammad Jarar, who carried out the shooting attack, is the son of Isma’il Jarar, the brother of Nasr Khaled Ibrahim Jarar, who was a senior commander in Hamas’ military-terrorist wing. He was one of the senior commanders in the battle waged in the Jenin refugee camp during Operation Defensive Shield. Nasr Khaled Ibrahim Jarar was killed on August 14, 2002, in a clash with IDF forces in Tubas (northeast of Nablus). According to Jarar family members, Ahmed Isma’il Muhammad Jarar was detained by the Palestinian security forces a number of times on accusations of possessing weapon, firing guns and belonging to Hamas. On one occasion he spent three months in the Palestinian prison in Jericho. According to relatives, he had close ties with his cousin Ahmed Nasr Jarar, who headed the squad that carried out the shooting attack at Havat Gilad in Samaria (QudsN, Palinfo and al-Anadolu News, January 18, 2018). According to an article published in the Jordanian paper al-Ghad, Ahmed Isma’il Muhammad Jarar was an officer in one of the Palestinian security forces (al-Ghad, January 19, 2018). The same claim was made the Arabs48 news website (January 18, 2018). The Palestinian security forces in Jenin and Ahmed Isma’il Muhammad Jarar’s father denied the reports (Palinfo Twitter account, January 18, 2018). The Hamas movement in the Jenin district and the Fatah student movement (the Shabiba) each issued death notices for Ahmed Isma’il Muhammad Jarar. According to the Fatah student movement (al-Shabiba) statement he had been a movement activist during his studies at the Jenin branch of the al-Quds Open University (Wafa, January 18, 2018, Facebook page of Jamal Hawil, January 19, 2018). Husam Badran, a member of Hamas’ political bureau, wrote of Ahmed Isma’il Muhammad Jarar that it made no difference whether he was a Hamas or Fatah operative. He was a Palestinian and an operative in the “resistance” during a difficult time, and every “resistance” operative, every shaheed and every prisoner was a source of pride for every Palestinian (Facebook page of Husam Badran, January 19, 2018). 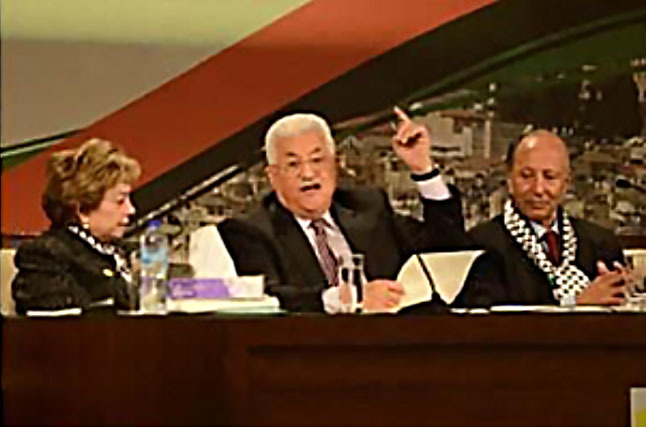 Jamal Hawil, a member of the Palestinian Legislative Council and a member of Fatah in Jenin, wrote on his Facebook page that “Fatah and Hamas are united on the ground…” He praised the “heroic shaheed” Ahmed Isma’il Muhammad Jarar, to whom he gave the title of “deputy chairman of the Shabiba movement at al-Quds Open University in Jenin,” claiming he had foiled the mission of the special Zionist forces to detain the fighter and commander Ahmed Nasr Jarar (Facebook page of Jamal Hawil, date, 2018). In conclusion, the organizational affiliation of Ahmed Isma’il Muhammad Jarar is unclear. Apparently during his studies he was an activist in the Fatah student movement. However, it also possible that at the same time he had ties to Hamas, with which his family is affiliated.